The former parish of Newdosk in Kincardineshire was annexed to Edzell ca. 1658. It was transferred to Fettercairn KCD in 1889. 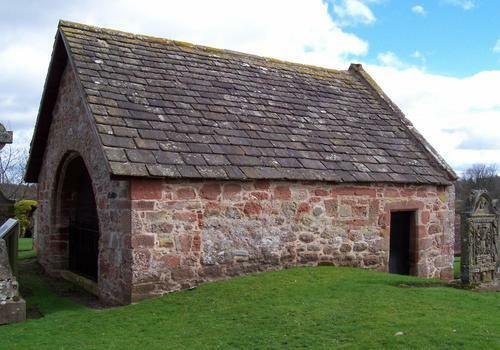 There was a mediaeval parish of Dalbog, now part of Edzell. General histories listed on the page for Books about Angus & Kincardineshire, in particular Warden, vol. 3, pp. 214-231. David Herschell Edwards - Historical guide to Edzell and Glenesk Districts (Brechin: 1876 and later eds) - there are also later editions with the title Historical Guide to Edzell, Fettercairn and Glenesk, etc. 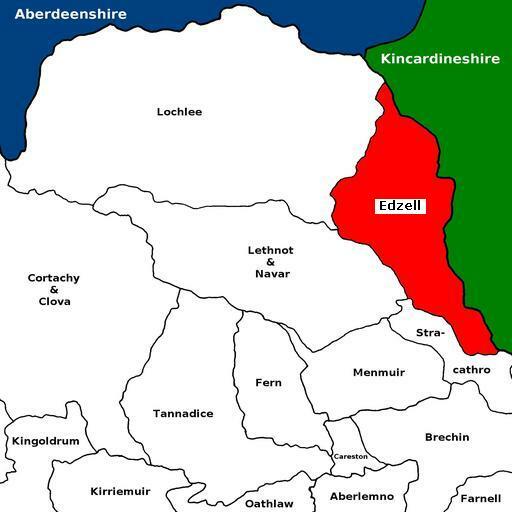 For the full range of maps of Edzell, see National Library's Maps. 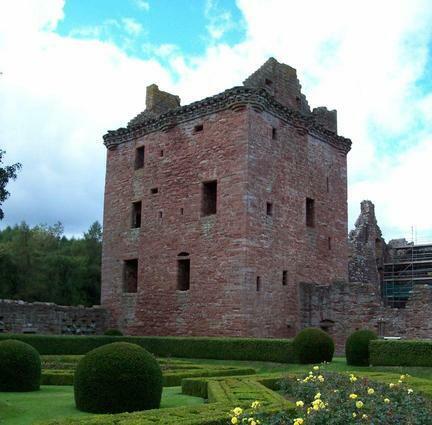 Geograph.org: Edzell - recent photographs of Edzell. National Grid ref. NO6068. Geograph.org: Dalbog - recent photographs of Dalbog. National Grid ref. NO5871. Geograph.org: Newdosk - recent photographs of Kirkton of Balfour, Newdosk. National Grid ref. NO6073. 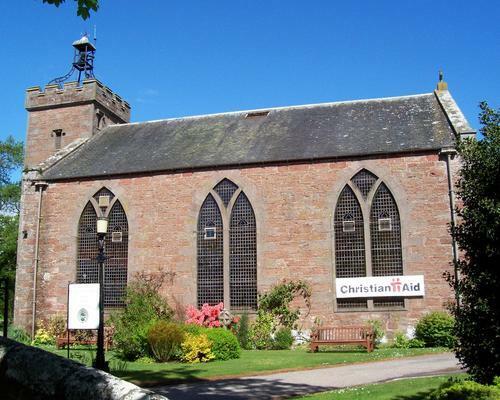 The Lindsay Aisle, which is all that remains of the former parish kirk of Edzell that was demolished in 1818, is located at National Grid ref. NO582687. 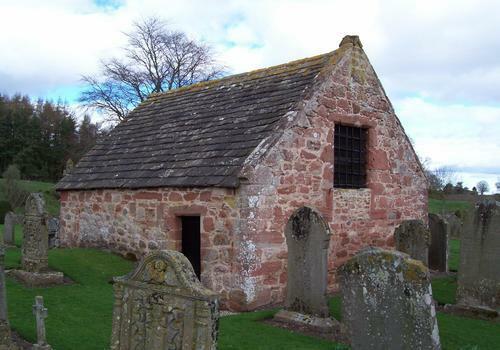 The kirkyard of the former parish kirk of Newdosk is at Kirkton of Balfour, NO602735. William Irvine 1682-1683 M.A. Marischal 1673; chaplain to David Lindsay of Edzell; adm .1682; d. bef. 5 Jun 1683, prob. unmar. John Copeland 1928-1931 b. 1 Aug 1865, Co. Down; M.A., Ph.D.; ord. 1894; adm. St Andrew's, Hebburn, Newcastle-on-Tyne 1915; tr. to Livingston WLN 7 Apr 1920; tr. here 23 Feb 1928; d. 14 Dec 1931 Brechin unmar. William Gordon Lawrence ?-1881-? b. ca. 1852 Strathdon ABD, son of John L., policeman; proprietor of Civil Service & Commercial College, Putney, London in 1911; mar. Jessie ---; issue: Mary C. G.; Douglas C.
Andrew Jervise recorded some monuments at Edzell in his "Epitaphs & Inscriptions", vol. 1, pp. 307-11 and at Newdosk on pp. 311-2 of that work. For a complete listing of monuments at Newdosk, see Newdosk MIs. In memoriam JOHN EADIE WILSON late farmer Burnside Alva died at Westside Edzell 29th Aug 1931. JAMES ALEXANDER MILLAR WILSON Hilton of Fern and Vayne 28.12.08-1.10.72. 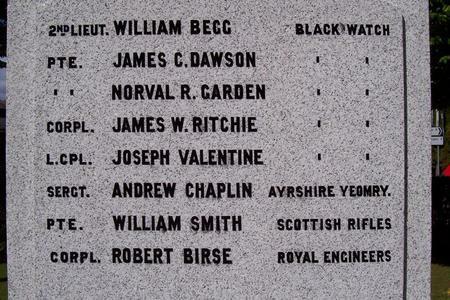 In loving memory of JOHN MILNE "Debden" Edzell who died 7th Sept. 1940, aged 78 years. Also his wife JESSIE BUCHANAN who died 10th Aug. 1952, aged 84 years. In remembrance of ENA FAIRWEATHER LOWDEN who died 13th January 1938, aged 20 years. And AMY LESLIE LOWDEN who died 7th March 1938, aged 27 years. Daughters of JOHN & SARAH LOWDEN Cowiehill Edzell. The above JOHN M. LOWDEN who died 11th March 1957, aged 66 years. And of his wife SARAH T. BUCHAN who died 1st May 1958, aged 66 years. Erected by JOHN BYARS senr baker, Edzell, in loving memory of his wife MARY ANN REA who died 21st July 1880, aged 41 years. Also of their family, GORDON LAWRENCE who died 7th April 1880, aged 16 days. JOHN who died 4th October 1914, aged 40 years. The said JOHN BYARS senior, died on 27th May 1915, aged 76 years. Also of his wife GEORGINA M. LONGMUIR who died 20th May 1925, aged 67 years. DAVID ADAM BYARS who died 28th April 1946, aged 58 years sixth son of the above. MARGARET ANDERSON BYARS died at Alverton Villa Edzell on 24th June 1948, buried on her 63rd birthday, eldest daughter of the above JOHN BYARS. 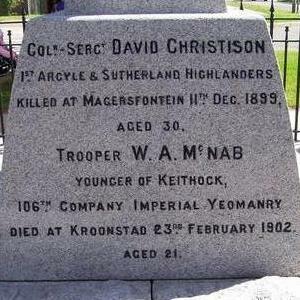 Colr-Sergt David Christison, 1st Argyle & Sutherland Highlanders, killed at Magersfontein 11th Dec. 1899, aged 30. 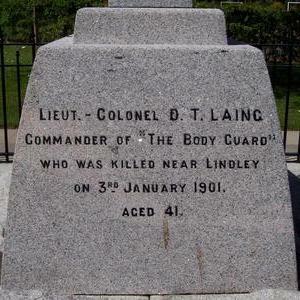 Lieut.-Colonel D. T. Laing, Commander of "The Body Guard" who was killed near Lindley on 3rd January 1901, aged 41. Above, at north end of the village: 2nd South African War of Independence. * William Alexander McNab, yr of Keithock, born 1880 in Morham, East Lothian, eldest son of William McNab of Keithock (by Brechin), who died in 1907 & Jeanette Isabella Beveridge, dau. of the Rev. John Gardiner Beveridge, minister of Inveresk. Pte. 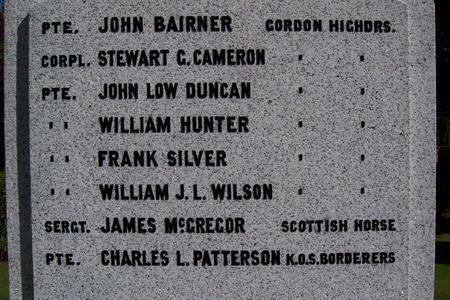 John Bairner - Gordon Highdrs. Corpl. Stewart C. Cameron - " "
Pte. John Low Duncan - " "
Pte. William Hunter - " "
Pte. Frank Silver - " "
Pte. William J. L. Wilson - " "
Pte. James C. Dawson - " "
Pte. Norval R. Garden - " "
Corpl. James W. Ritchie - " "
L.Cpl. Joseph Valentine - " "
Sergt. Andrew Chaplin - Ayrshire Yeomry. Pte. 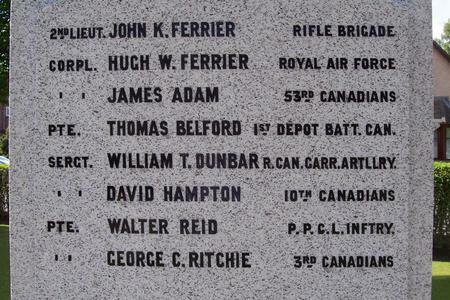 Thomas Belford - 1st Depot Batt. Can. Sergt. William T. Dunbar - R. Can. Carr. Artillry. Pte. Walter Reid - P.P.C.L. Inftry. Pte. 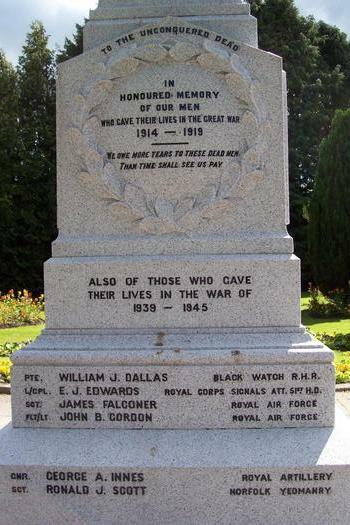 William J. Dallas - Black Watch R.H.R. L/Cpl. E. J. Edwards - Royal Corps Signals Att. 51st H.D. For 1821, 1871 and 1881, the numbers in the Angus (ANS) and Kincardineshire (KCD) parts of the parish are given separately. 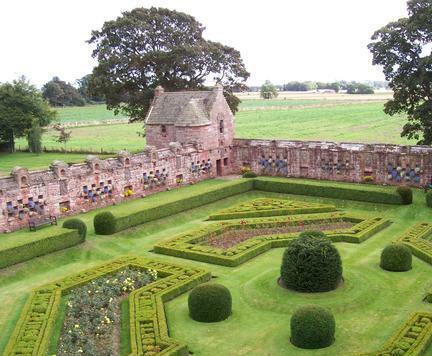 Edzell was in the Commissariot of St Andrews.